Peanut recently ran out of watercolor paint. This is nothing new. In fact, it happens quite often as she really likes to paint. 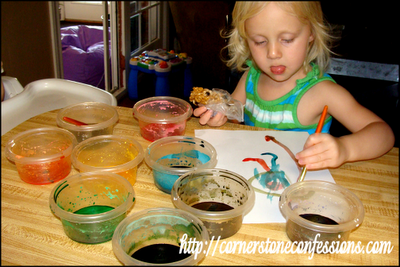 However, instead of making another trip to the store, we decided to try our hand at making our own watercolor paint. The result? We will never buy watercolor paint again. This stuff works great! All you need are 4 ingredients…okay 5. I forgot to include food coloring in the pic. Oops. Aw well. Mix the first four ingredients in a small mixing bowl. Watch it fizz. When the ingredients stop reacting, separate the mixture into small containers. We used several small Ziploc containers but an egg carton would probably be a great idea too. 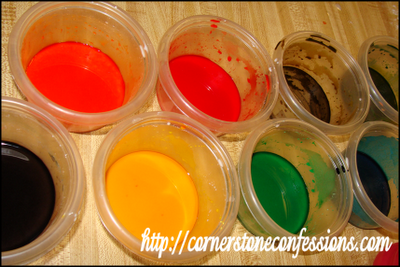 Add food coloring to each container to get the desired colors. We usually put in about 6 or 8 drops per container. Allow to sit a couple of hours to harden. After about 4 hours, if there is any liquid remaining you may either paint with it right away or drain before storing. We created 9 different colors with one recipe which made more than plenty for each color. For more colors besides the traditional food coloring colors we used the following combinations to create more shades. This could be a great home school demonstration of color mixing by the way. Note: You can’t make a true black paint with food coloring mixing. I know. Bummer. But, you can create a lot more shades of other colors like dark green and pink and aqua which is fun. I think my favorite thing about the paint when its all said and done is the vibrant colors they produce. Peanut’s paintings were beautifully bright and very quick to dry. Needless to say, we will definitely be doing this chemistry experiment again. Now, what homemade art recipe should we try next? Any suggestions?